What Kind of Ore did Nephi Use to Make the Plates? According to Nephi, he was preparing a record of the “more sacred things,” and he only ever wrote things on his small plates that were of sacred significance (1 Nephi 19:5–6). In the temple or tabernacle of ancient Israel, most of the most sacred objects were gold or gold plated12. These sacred words and objects were most highly valued and making them of the most precious ore reminded all who saw them of their enormous, eternal value. Nephi prepared his small plates as his people were completing the construction of a temple “like unto Solomon’s temple” (2 Nephi 5:16; cf. vv. 28–32). Numerous connections have been made between Nephi’s account and the temple.13 As a temple text, the plates on which Nephi made his sacred record would also have been a temple object. These holy records were handed down in the priestly lineages of Jacob and then of Alma. Thus, the nature of tumbaga served the purposes of the Lord, practically, functionally, meaningfully, symbolically, and spiritually. 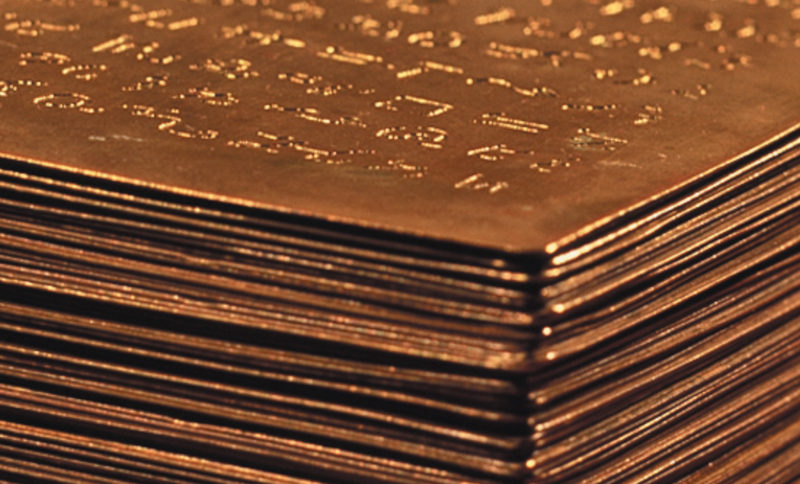 This alloy readily available to Nephi allowed him, and other record-makers mentioned throughout the Book of Mormon, to make plates that would have the necessary utility for engraving records while also having the proper golden appearance of a sacred temple object. Jerry D. Grover Jr., Ziff, Magic Goggles, and Golden Plates: The Etymology of Zyf and a Metallurgical Analysis of the Book of Mormon Plates (online PDF, 2015). Kirk B. Henrichsen, “How Witnesses Described the ‘Gold Plates’,” Journal of Book of Mormon Studies 10, no. 1 (2001): 16–21. “Of What Material Were the Plates?” Journal of Book of Mormon Studies 10, no. 1 (2001): 21. Robert F. Smith, “The ‘Golden’ Plates” in Reexploring the Book of Mormon: A Decade of New Research, ed. John W. Welch (Provo, Utah: FARMS, 1992), 275–277. Read H. Putnam, “Were the Golden Plates made of Tumbaga?” Improvement Era 69, no. 9 (September 1966): 788–789, 828–831. 1. The wording of 1 Nephi 18:25 can be somewhat confusing, since it uses “both” and then lists three different ores. Jerry Grover, a professional geologist, explains, “Native gold and silver nearly always occur together as one ‘ore’ in nature. Technologies to separate gold and silver (called ‘parting’) were not known to be practiced in the Old World before the fifth century B.C …. There has been no evidence discovered in the New World that any pre-Columbian culture possessed gold and silver separation technologies.” Thus, Grover explains, “the most consistent reading of the scriptural passage above is a binary ore of gold and silver, with the additional separate ore being copper.” Jerry D. Grover Jr., Ziff, Magic Goggles, and Golden Plates: The Etymology of Zyf and a Metallurgical Analysis of the Book of Mormon Plates (online PDF, accessed November 13, 2015), 79. 2. Joseph Smith, The Book of Mormon: An Account written by the Hand of Mormon, Upon Plates taken from the Plates of Nephi (Palmyra, NY: E.B. Grandin, 1830), 50. 3. Brant A. Gardner, Second Witness: An Analytical & Contextual Commentary on the Book of Mormon, 6 vols. (Salt Lake City, Utah: Greg Kofford Books, 2007–2008), 1:357. 4. Read H. Putnam, “Were the Golden Plates made of Tumbaga?” Improvement Era 69, no. 9 (September 1966): 788–789, 828–831. This was based on a presentation given at the Fifteenth Annual Symposium on the Archaeology of the Scriptures, May 16, 1964. See UAS Newsletter no. 90, July 21, 1964. 5. Putnam, “Were the Golden Plates made of Tumbaga?” 830. This assumes an 8-karat gold alloy, with about 24% gold, 73% copper, and 3% silver, and 50% air space. 6. Jerry D. Grover Jr., Ziff, Magic Goggles, and Golden Plates, 74–105. Grover used the eyewitness descriptions, sampling of pre-Columbian tumbaga artifacts, known ancient metallurgical techniques, and direct testing of metal sheets of copper and copper alloyed with gold and silver to test Putnam’s assumptions. 7. See Kirk B. Henrichsen, “How Witnesses Described the ‘Gold Plates’,” Journal of Book of Mormon Studies 10, no. 1 (2001): 17. 8. William Smith, The Saints’ Herald, October 4, 1884, 644; as cited in Henrichsen, “How Witnesses Described the ‘Gold Plates’,” 17. 9. Of What Material Were the Plates?” Journal of Book of Mormon Studies 10, no. 1 (2001): 21, explains: “It is of interest that tumbaga was commonly gilded by applying citric acid to the surface. The resulting chemical reaction eliminated copper atoms from the outer .0006 inch of the surface, leaving a microscopic layer of 23-karat gold that made the object look like it was wholly gold” (spelling silently corrected). It is important to clarify that in pre-Columbian America, only the use of oxalic acids is documented for use in depletion gilding. Furthermore, if the plates contained silver (as suggested by 1 Nephi 18:25), acid gilding would not have removed the silver from the surface. Alternative methods for gilding would have been necessary, such as the application of special aqueous pastes or a solution of alum, iron sulphate and salt at room temperature. After ten days, the surface was washed with a salt solution and then heated to convert the spongy surface to a smooth, compact, richly golden surface. There are also other methods available that would have removed the copper, silver, and other impurities from the surface. (Jerry Grover, personal communication, December 13, 2015). 10. Robert F. Smith, “The ‘Golden’ Plates” in Reexploring the Book of Mormon: A Decade of New Research, ed. John W. Welch (Provo, Utah: FARMS, 1992), 275–277. As an alternative to tumbaga, Jerry Grover (via personal communication, December 13, 2015) suggests the plates could have been simply copper covered in a thin layer of gilded gold. This practice is also attested in Mesoamerica. 11. The gold gild may have worn off on the edges, allowing for the oxidation of the edges. Josiah Stowell reportedly saw a small corner of the plates when part of the frock Joseph was covering them in slipped away. He said the plates “resembled a stone of a greenish caste,” which is consistent with the plates being made of a copper alloy which had oxidized. See Morning Star 8, no. 29 (Limerick, Maine; November 16, 1832). 12. These include the ark of the covenant, the incense altar, the table of the bread of the presence, the menorah, and the cherubim. See William J. Hamblin and David Rolph Seely, Solomon’s Temple: Myth and History (New York: Thames and Hudson, 2007), 19–20, 25. 13. See, for example, LeGrand L. Baker and Stephen D. Ricks, Who Shall Ascend into the Hill of the Lord? The Psalms in Israel’s Temple Worship in the Old Testament and in the Book of Mormon (Salt Lake City, Utah: Eborn Books, 2011), 466–471; Joseph M. Spencer, An Other Testament (Salem, Oregon: Salt Press, 2012), 41–57; John W. Welch, “When Did Nephi Write the Small Plates?” in Pressing Forward with the Book of Mormon: The FARMS Updates of the 1990s, ed. John W. Welch and Melvin J. Thorne (Provo, Utah: FARMS, 1999), 75–77. How Was the Transfiguration of Jesus and the Three Nephites a Temple-Like Experience?